I first encountered agriculture in the late 70’s when a senior in high school. The program I was in that year believed that hands on learning made the deepest imprint, and that was true. We spent two weeks in the Fall, and two weeks in the Spring working on a Northern Wisconsin dairy farm, doing every conceivable chore: I rode atop an ancient combine and -driving that thing all by myself – harvested rows of buckwheat. We got to feed newborn calves from large bottles. Helped build a bunk house and saw fallen wood for the woodstove. And of course, we all helped milk the cows. After that experience I planned to settle out in the country and farm in some vague and self sustaining way. One thing led to another and I ended up in inner city Oakland instead, as a single mother, rather impoverished. I set up a work trade doing gardening in exchange for reduced rent, and realized farming could be done in the city as well as the country. I’d work away in the soil, my young daughter playing somewhere in the yard, neighborhood kids coming in to help harvest apples, dig out tree stumps, or just stand under the giant sunflowers in awe. In the midst of one of our long California droughts, I met some permaculture enthusiasts while volunteering at my daughter’s college garden. I learned so much while weeding beside them! One thing that really surprised and impressed me was the fact that the number one way to save water was to build good soil. That idea propelled me to learn all I could about permaculture. Any time I got my hands on a book I’d read the whole thing in one sitting, gobbling it up, feeling nourished and inspired when I’d ingested all the ideas and images. Fast forward to three years ago when I bought my first home, in Vallejo. My first goal, in moving in, was to build good soil! Following the sheet mulching guidelines I’d gotten in a pamphlet somewhere, I removed my weedy front and back lawns, laid down layers of with cardboard, compost and woodchips. I built a worm bin, got a composting system set up, and started putting in food crops and plants to attract birds, bees and other wild critters. You can imagine this was a lot of work for an older woman! Working with a zero budget, I hauled in free supplies one five gallon bucket at a time. I learned I could not accomplish the tasks I set before myself overnight. This offered the benefit of observing patterns of sun,shade and rain aroundmy yard across the seasons. After two and a half years of being a weekend garden warrior, I was nearing the accomplishment of my vision. Then I happened upon a workshop put on by Sustainable Solano. I bonded with one of the staff members while conversing about the wonder of fava beans, and found out about becoming a food forest keeper. I applied the next week and, wonder of wonders, was selected! 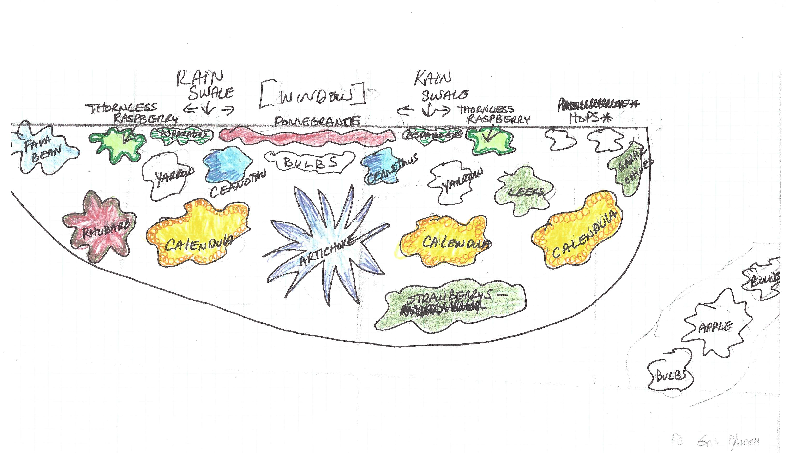 My vision expanded to include a laundry to landscape feature, and plant guilds: something I hadn’t learned about in my previous permaculture studies! The Work Party: Oh the buzz and enthusiasm! The drilling and digging! The conviviality and conversation around a lunch table laden with homemade food to feed the volunteers! The work party was a kind of a blur for me, to be honest. I liken it to being inside a beehive where a community of workers chip in to accomplish a tremendous amount of work in a short amount of time, all executed with generous and friendly attitudes! Trenches were dug and flexible pipes were laid. Holes were painstakingly drilled through a stucco wall so thick it was said my house could be a bomb shelter! An apple tree plant guild was put in, and other edibles were scattered amongst the existing garden. Last but not least a mountain of woodchips was dispersed wheelbarrow by wheelbarrow by the diehard volunteers who lasted all day. Lemon cake was a delicious reward for all the hard labor. It still astounds me what was accomplished that day, and I am grateful with each load of laundry I do. The fruit trees are thriving with all the regular grey water! 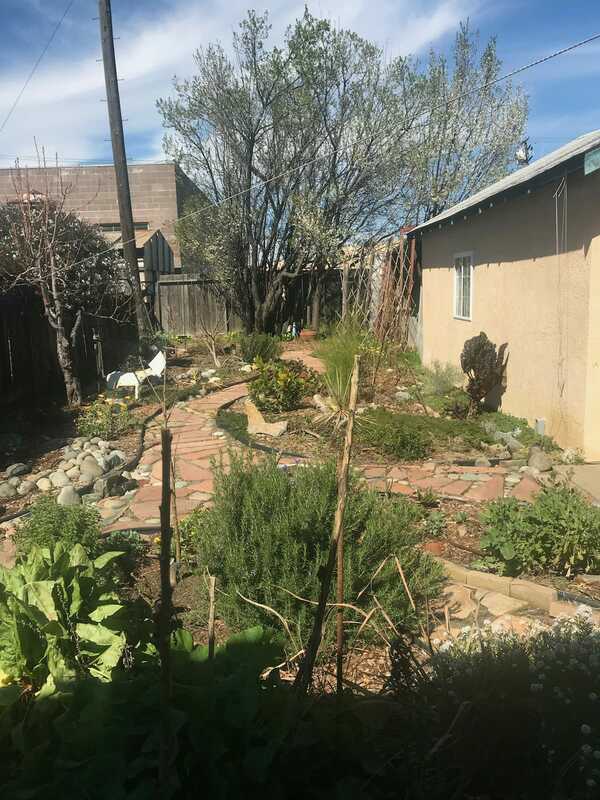 I named my garden the Ripple Effect because I want to move outward from my yard to have permaculture radiate throughout my neighborhood. As I work in the front yard, I get to connect with neighbors who are out and about. We discuss all manner of things, exchanging ideas and challenges regarding the garden, the neighborhood, the town. I’d like to help my next door neighbor convert her yard to something sustainable and beautiful. Eventually I hope to get a beautiful Linden tree or some sunflowers on the vacant lot on the corner. If I could gather the human and financial resources I’d like to use the vacant lot on the back side of my fence for growing trees or bamboo, or food crops….something to enhance the health and beauty of the area. See a gallery of Ripple Effect photos here.